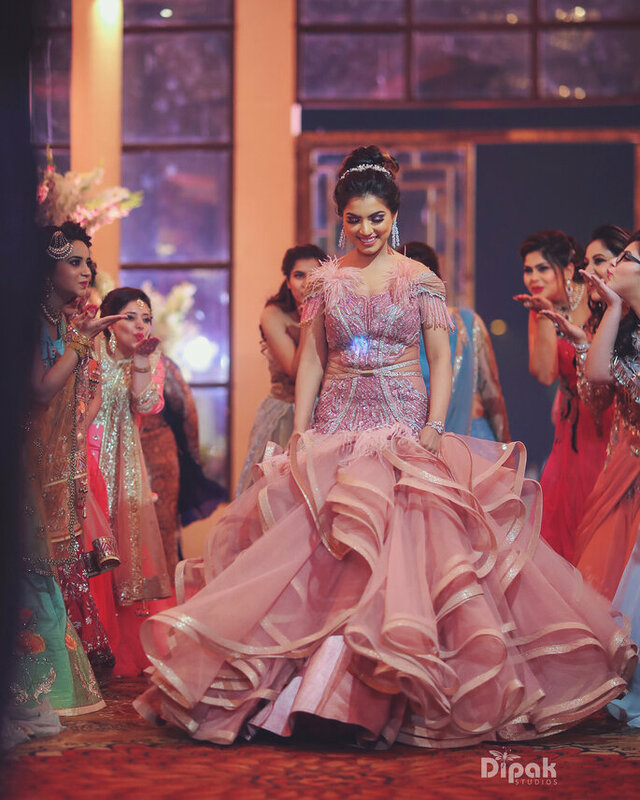 Cocktail ceremony is gradually becoming every Indian bride’s favorite wedding function. And why shouldn’t it be? 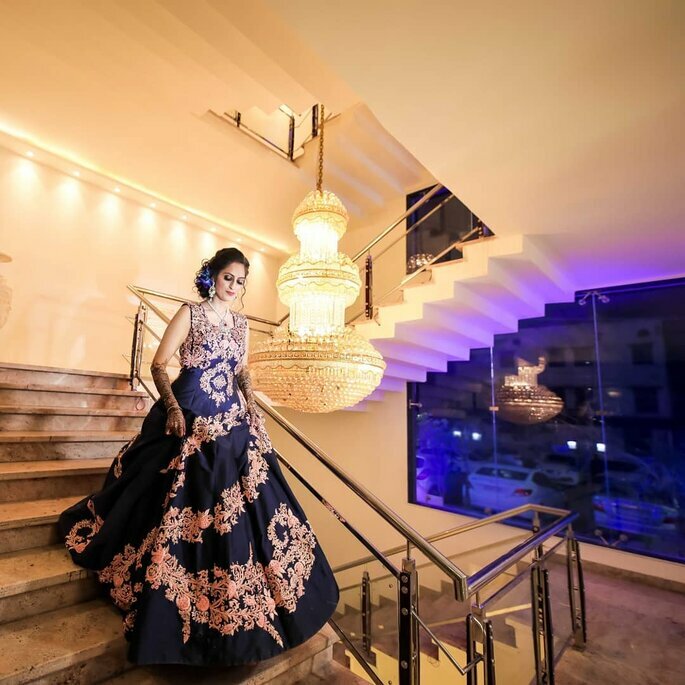 After all, the brides get to adorn themselves in magnificent and at the same time eccentric floor sweeping gowns that perfectly shows the maverick side of the Indian brides-to-be. The struggle comes when your designers end up showing you the same old bunch of gowns that everyone’s decking themselves up in or have become obsolete and you experience a terrible blank out when they ask you if you have something in mind. Hence, to make everyone’s job easier, we have carefully curated these offbeat cocktail bridal gowns for every bride-to-be, if you want to make jaws drop. Scroll down to read! 1. This is how you wear an exaggerated tulle flare gown like a queen. What’s unique about this cocktail gown is that even with its massive multiple layers flare, it doesn’t go overboard and surprisingly gives an opulent appeal. It’s perfect if you want your colors in lower tones and want to play with the patterns. 2. Are you a bride who can’t manage wearing heavy cocktail gowns and instead lean towards comfort every time you shop for weddings? Well then worry not because we have something unique in store for you. This palatial Prussian blue gown that is relatively on the lighter side is an ideal choice for you. Its intricate embroidered motifs will definitely make you stand out. 3. Fishtail gown has never looked so extraordinary and the subtle hues with unique garment work gives off an exciting look. This gown leaves a little more for you to play with your inner fashionista. 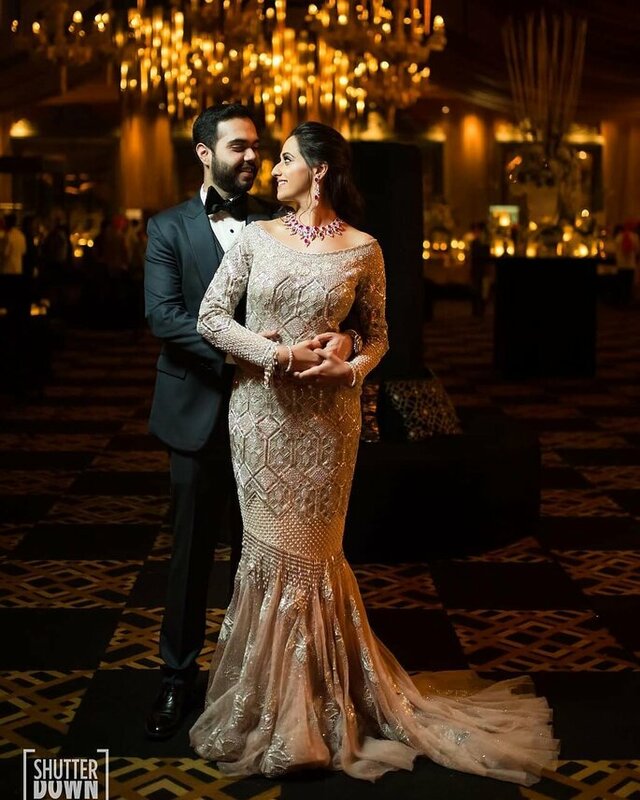 So, if you want to take it up a notch, wear this gown with an embellished belt and rock this ensemble just like this bride did. 4. Speaking of embellished belts, how striking is this two chains metal belt! 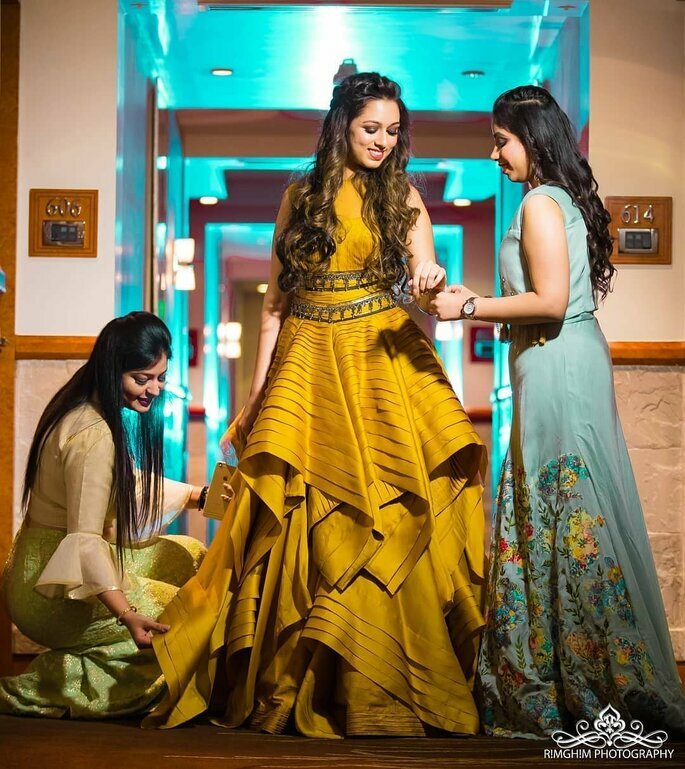 This uneven inverted large pleated gown is an excellent choice for any bride who wants to DIY her accessories and wants to give her gown a splendid appeal with elevated embellishments. 5. Isn’t this picture perfect beautiful? 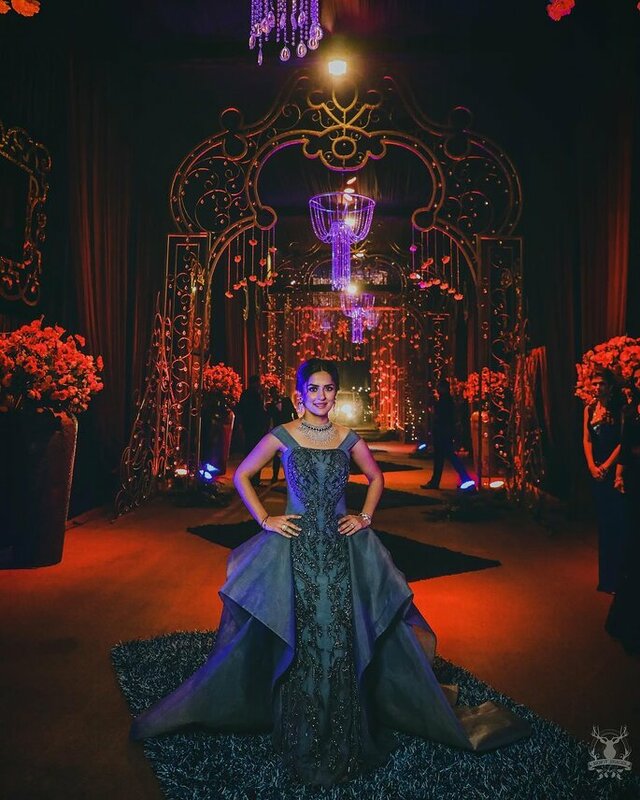 The grandiose ensemble, with its asymmetrical side flares, is giving a much needed glam to this bride-to-be. This off-shoulder royal blue gown will go perfectly with a heavy stately neck piece and glittering earrings. Get ready to bemuse everyone with your beauty. 6. 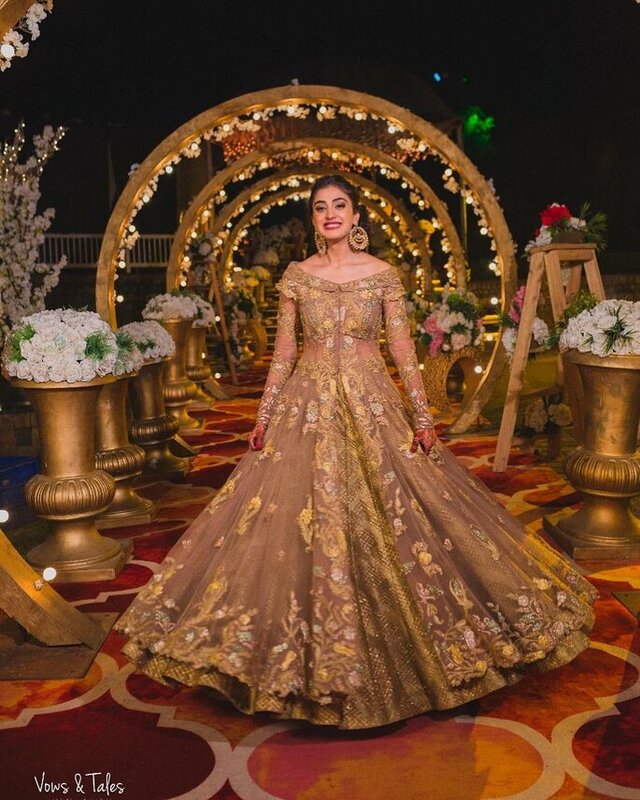 When elegance is blended with uniqueness, we get presented with this fairy tale wedding ensemble. The hefty statement earrings on this ornate beige kurta gown and crimson red lip shade make one impeccable ensemble for a dainty bride-to-be. You can wear your hair open in a Lana Del Ray-esque bouffant hairstyle. 7. Well this one is just a classic choice if you are opting for a Disney princess look. 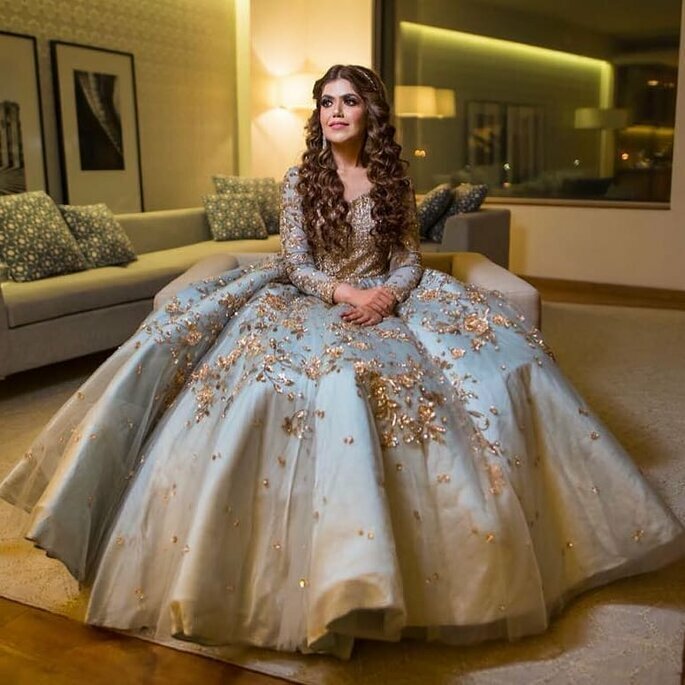 This pastel cadet blue ball gown with foliage embellishments, and its overall decked up bodice, will undoubtedly make you look like masterpiece sent straight from the heaven. You can also wear any baby’s breath bun style with this gown. Let us know in the comment section below your desired cocktail gown!